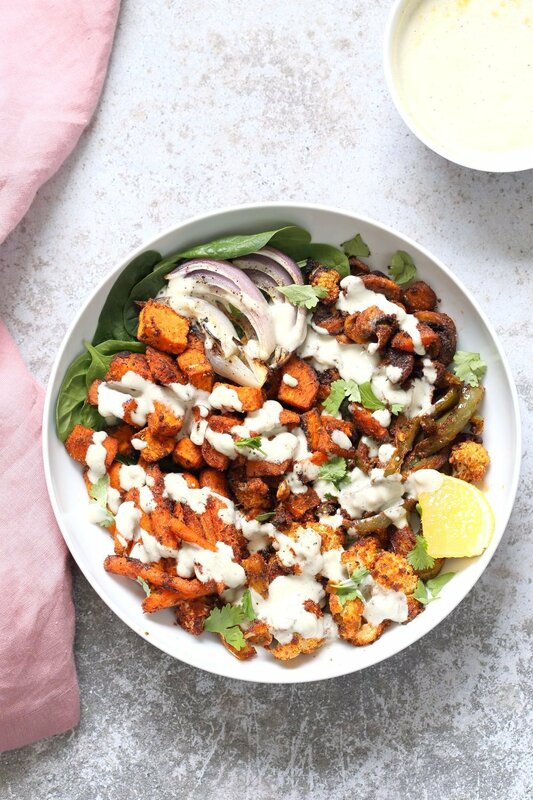 Since I made this Sprouted Lentil Bowl with Cajun roasted sweet potatoes, i have been dreaming about using the spice blend over other veggies. 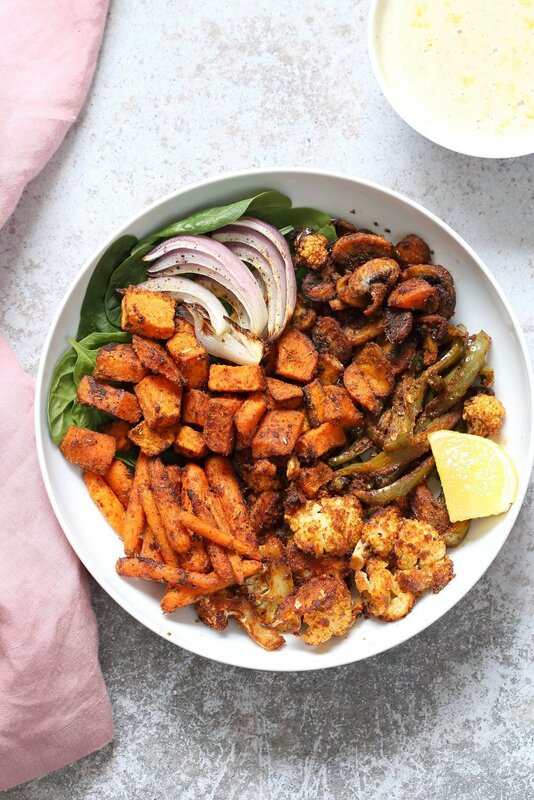 Hence, this simple roasted veggies bowl. Slice up the veggies of choice, toss in Cajun blend, some nutritional yeast and bake. Serve these delicious veggies in bowls, wraps, tacos with the creamy garlic sauce. Its Easy, Hearty, Smoky, spicy and so Flavorful. I make my own cajun blend as then it is easier to control the heat, flavor and salt. Store bought spice blends might already have salt so adjust accordingly. Add some sprouted lentils or chickpeas to the mix for a hearty meal. I love this meal without beans for dinner. Once you have the dressing, this is a quick sheet pan dinner. This garlic sauce is adapted from my book’s white garlic sauce. To make this nut-free use my nut-free garlic sauce from Everyday Kitchen book (Yes, there are nut-free options for almost all sauces and recipes! 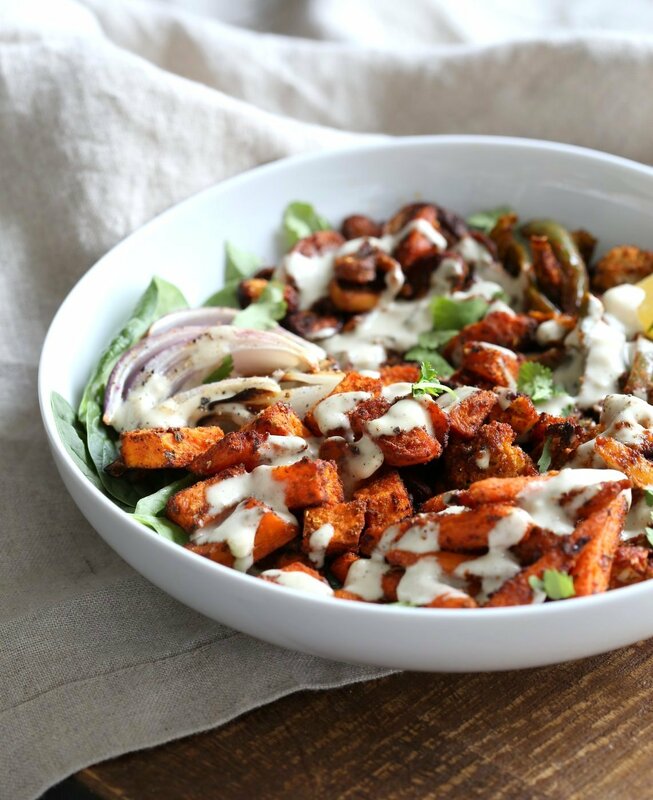 ), or use tahini garlic dressing. Use seasonal veggies of choice and other spice blends such as berbere, baharat(<– so good) and garam masala from the book! If you make this bowl, do let me know how it turned out. Tossed in spices and ready to bake. 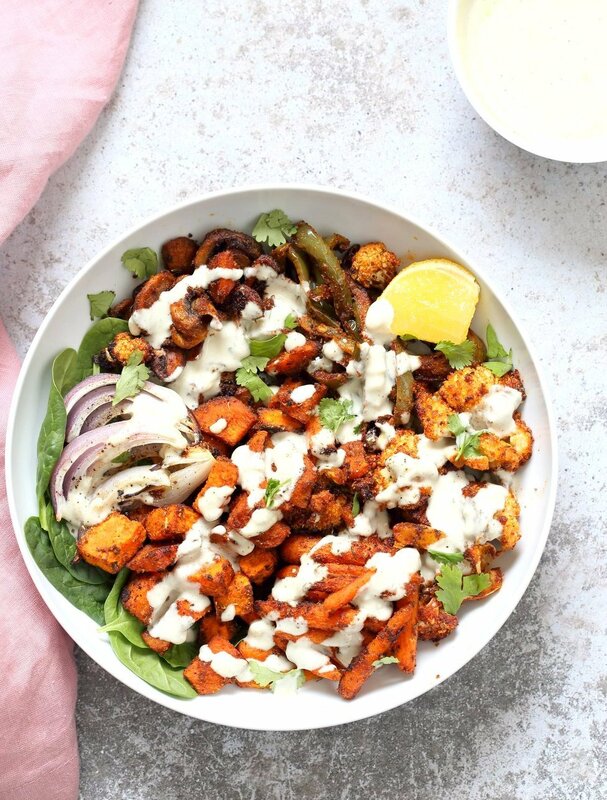 Cajun Roasted Vegetable Bowl with Garlic Sauce. Mushrooms, Cauliflower, Sweet Potato, Peppers, Onions, tossed in cajun spice blend and roasted. Serve in a bowl with crunchy greens and creamy garlic sauce or make wraps or tacos. Vegan Glutenfree Soy-free Recipe. Can be nut-free. Preheat the oven to 425 degrees F. Chop the vegetables and add to a large bowl with a lid. Mix all the spices, cajun spice, nutritional yeast if using, and salt in a bowl and set aside. Drizzle the oil and lemon on the veggies. Close the lid and shake to coat well. Or rub in using hands. Sprinkle the spices all over, close the lid and shake shake to coat. Spread the vegetables on parchment lined sheet. Bake for 30 minutes. Move the veggies around after 20 mins and also remove the quick cooking veggies like peppers if they are roasted. Make the garlic sauce: Blend until smooth. Taste and adjust flavor, salt, herbs. Add some black pepper if you wish. Assemble your bowl, wraps or tacos with greens or lettuce, generous helping of the roasted vegetables, drizzle of the garlic sauce, some onion or tomato (optional). Variation: Add 3/4 cup cooked chickpeas or lentils or sprouted chickpeas or lentils to the bowl with veggies and roast. 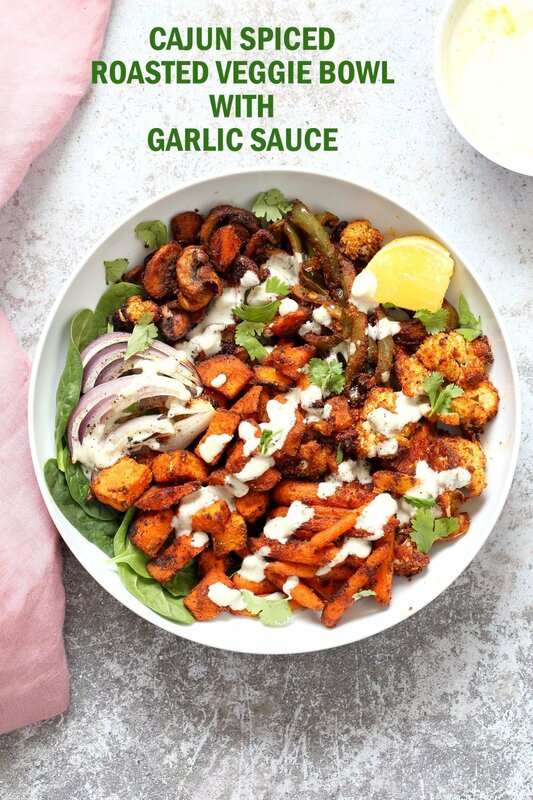 To make this nut-free use my nut-free garlic sauce from Everyday Kitchen book, or use tahini garlic dressing. Use seasonal veggies of choice and other spice blends such as berbere, baharat and garam masala from the book. Cajun spice is so so tasty with tofu, tempeh, sweet potatoes, butternut squash, pumpkin, and chickpeas! This vegetable bowl looks absolutely stunning. I love how easy it must have been to make! Once you have the blend, its super easy to put the bowl together. The veggies also make great tacos. This really looks great. Is there a way it can be done oil-free? Yes see above. You can also use non dairy milk or a thin flax egg (1 tbsp flax seed meal mixed with 4 to 5 tbsp water) and then add the spices and mix to coat. Anything that will help the spices to stick. 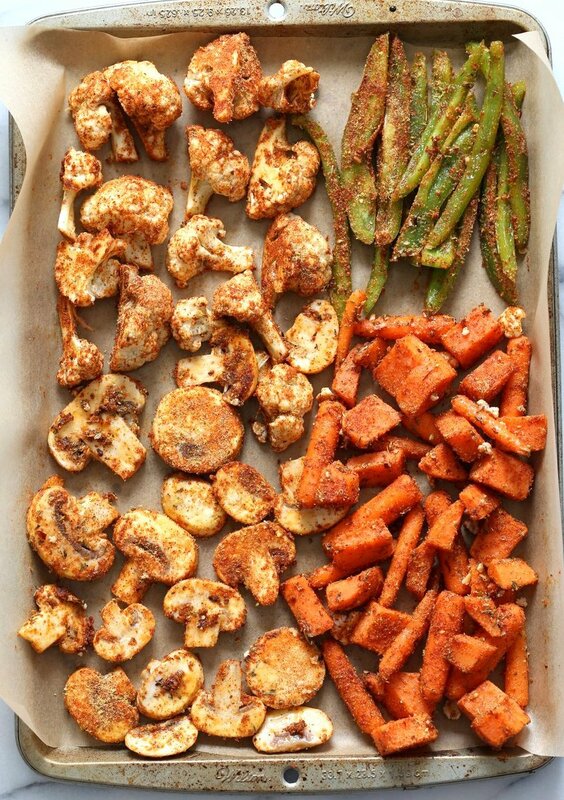 without oil, the veggies will tend to dry out a bit, to also add a tbs of flour or starch with the spices for a light coating on the veggies to reduce the moisture loss. I am wondering if aquafaba could be used I stead of oil? Or is there another no oil possibility? I have removed oil from my cooking but haven’t figured out how to get spices to cling to veggies when roasting. Thanks for any suggestions. yes, use aquafaba + lime. The veggies might tend to dry out a bit, so maybe also add a tbsp or so flour or starch for a light coating that will help crisp as well as reduce the moisture loss. I was wondering if this recipe will work without the nutritional yeast or if you can suggest a substitute? Would ground flax seeds work? Thanks again for your beautiful website and cookbooks. Some miso (use chickpea miso for soy-free version) will add a deeper flavor. or you an adjust the flavor with some additional garlic, and some herbs and go with a garlic sauce dressing rather than cheesy garlic sauce. This is a very delicious bowl, made the recipe as written, with the exception of cutting amount of Cajun seasoning in half (DH is sensitive to spice). Used white miso in the garlic sauce (I’m partial to the particular depth of flavour miso imparts). To make it a complete meal for Friday night, I served it topped with a package of TJ siracha baked tofu (heated through in a dry pan), DH enthusiastically declared this recipe a redo, and I wholeheartedly concur. This makes three very generous portions. The garlic sauce would make a great dipping sauce for veggies or sauce for pasta or rice, maybe with fresh chopped herbs stirred into it …? Thanks Richa for another wonderful recipe. Awesome! Yes definitely, some fresh basil, rosemary, dill all go well in the sauce. Its great as is to dip raw or roasted veggies, or as a dressing. What’s the purpose of adding the nutritional yeast to the spice mix/vegetables? Can I leave it out? I’m not vegan (used to be a vegetarian) but I still like meat free dishes…. it adds a cheesy flavor. you can leave it out. This is one of my favourite recipes ever! We have it at least twice a month. The sauce is amazing on absolutely anything.